Since 1974 the Artpark Theatre complex has been a haven for the local arts scene near the Niagara River Gorge. Every summer the site comes alive with a music festival that brings together the best of local music acts alongside international powerhouses and vintage rock greats. 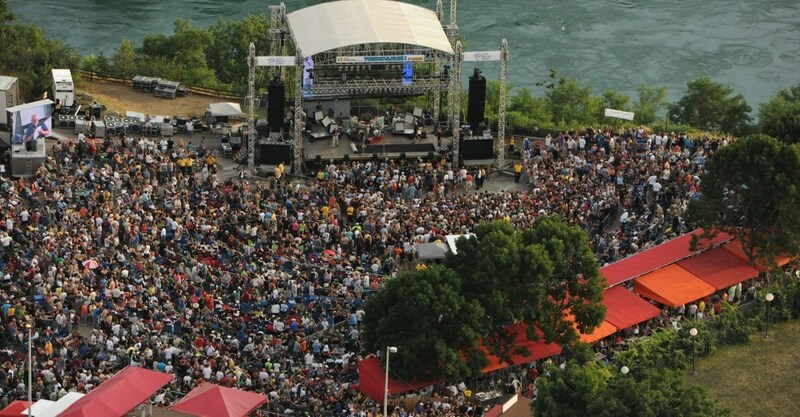 From June until October, ‘Tuesdays in the Park’ runs weekly performances at the Artpark Amphitheater – a site resting atop the Niagara River Gorge. This venue can host a crowd ten thousand strong. The early evening gigs on offer for Tuesdays in the Park are a star-studded affair every summer Tuesday, with the 2015 lineup including Deep Purple, Peter Frampton and Blondie. Artpark was fashioned primarily to accommodate this summer festival, but the grounds are multi-purpose. As a state park in New York, Artpark is an idyllic setting for family gatherings and various events other than concert performances. Artpark proudly advertises its regular theater and music camps, and the grounds are regularly used for family-friendly theatrical productions. Explorers will also find small hiking trails, nature sites and fishing docks. The facilities at Artpark have been kept up to date so that performing acts can be experienced without technical fault. The main venue on the complex is the Mainstage Theater – one of the largest stages in the state of New York with a capacity of 2400 attendants. The theater even opens from the rear gates so that the stage can perform to an outdoors audience as well. Both Broadway musicals and local children’s plays are performed here, ensuring there’s always something on offer on the calendar. Attached to the Mainstage Theater is the Theater Terrace Lounge, perfect for big band and philharmonic performances. This covered terrace functions as both a seating area for performances and a private party area. In summer the park comes live with the star-studded performances and galas, but Artpark is a great destination all year round, even if just for use of the picnic facilities. Book a ticket to a play, or see your favourite acts on stage – or just take in the picturesque scenery of the Niagara Region from a great vantage point.